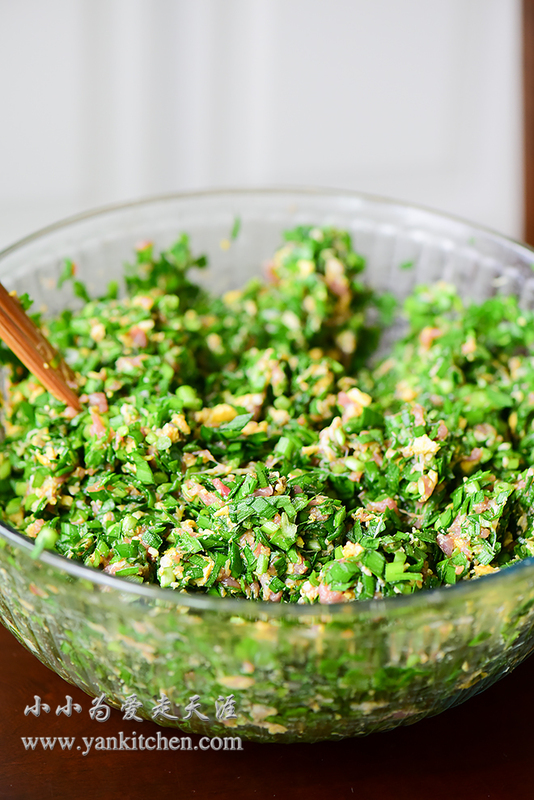 Garlic chive is a vegetable that is popular across Asia. We use it in stir fries, soups, dumplings and various dim sums. Surprisingly it never became popular in United States and never made their way to American grocery stores. For those who are interested, there are two ways to get garlic chives. You can either grow them yourself, or just drive to the nearest Asian grocery store. Sometimes garlic chive is sold at local farmer market too. Garlic chive tastes a lot like leek, but with a milder, more delicate grassy and earthy flavor. The best season for garlic chive is spring. After a long cold winter, garlic chive sprouts earlier than most vegetables. 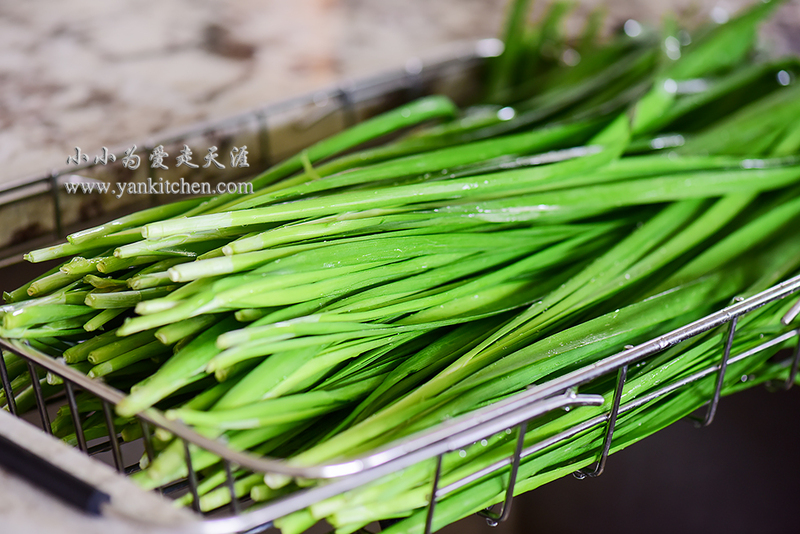 Chinese people consider garlic chive to be a messenger of spring. When summer comes, its flavor gets stronger and become less popular. My favorite way to enjoy garlic chives is dumplings. All that beautiful colors come from vegetable purees, very natural and healthy. Add vegetable purees along with bread flour, salt, oil and water to three different mixing bowls. Knead with hand until you have three smooth and elastic balls of dough. Heat a light weight cast iron wok over high heat. Add 1 to 2 tablespoons vegetable oil. Add eggs and gently scramble. Remove from heat when done. Add grinded pork along with soy sauce, rice cooking wine, oyster sauce, ground ginger, ground white pepper, and sugar to a large mixing bowl. Whisk with a pair of chopsticks clockwise for several minutes. Add some water/ chicken stock while whisking. When pork mixture becomes sticky, add scrambled eggs. Whisk until everything is well combined. Rinse fresh garlic chives under running water and drain. With a kitchen knife, finely chop the garlic chives. Add to pork filling. Drizzle a couple tablespoons vegetable oil on top. Whisk until everything well combined again. The last step is to add salt to taste. Use a large rolling pin to roll the dough into large flat pieces. And then feed the dough through a stand mixer roller separately. Gently lay down a layer of green dough on countertop. Put a layer of yellow dough on top. With a sharp knife, cut the roll into 1/4 inch thick pieces. Look at that pretty pattern! 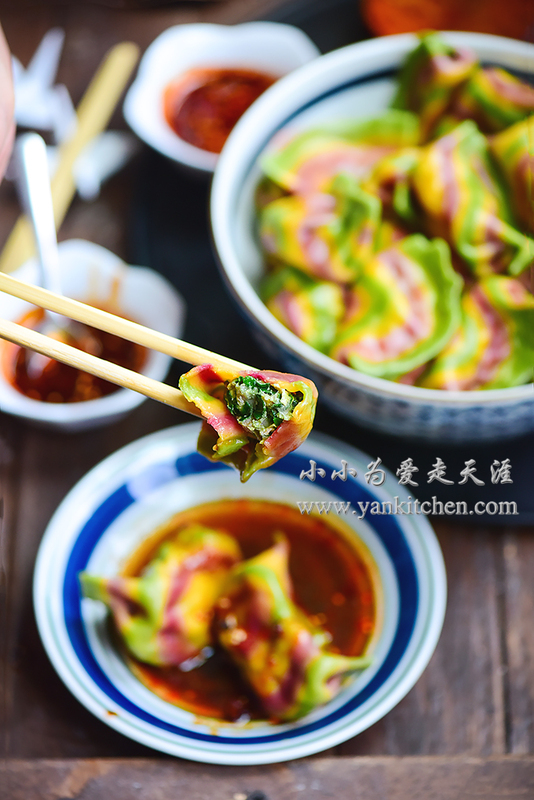 With a small rolling pin, roll each piece into thin flat dumpling wrappers. Add dumplings to a large pot of boiling water. When the water boils again, add a cup of cold water. Dipping sauce is made from soy sauce, vinegar, chili pepper sauce and a little bit of sugar. Freeze any extra dumplings and seal in a Ziploc bag. They can be stored in freezer for up to 3 months. I steam some dumplings later. They are both pretty and tasty too.